Arma 3 might be the new hotness, but that doesn’t mean Bohemia Interactive has forgotten about Arma 2. It provides a bunch of fixes and engine optimisation, but the main focus of the patch is the migration from GameSpy to Steam. 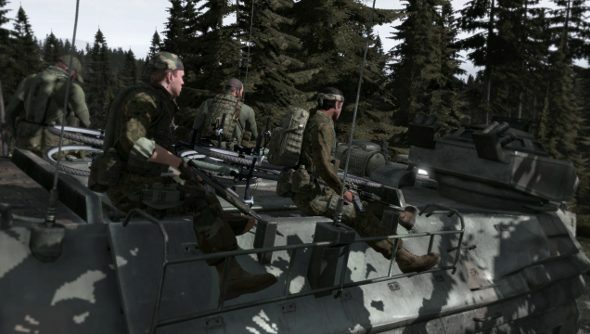 With GameSpy closing its doors, Arma 2 was one of the titles affected, relying on the platform for multiplayer matchmaking. But Bohemia Interactive have made the shift to Steam, and it’s fixing every version of the game. “As you may have heard, GameSpy is discontinuing its services and it was therefore of paramount importance to offer an alternative for the passionate Operation Arrowhead players who have supported our game and our company for so many years,” the developer said. The update is rolling out via Steam, though, so it won’t update the retail version. Not to worry, though, as all Arma keys – including DLC – can be activated on Steam now. Just put in your CD Key after selecting “Activate a Product on Steam” in the games dropdown menu. The original Arma and Bohemia’s older games have not been updated to work with Steam, but the developer has put together a system that will allow you to continue playing these games online by adding servers here. Here’s an FAQ for each game in case you’ve encountered some problems.